A common cause of problems in rigid tiled flooring is cracking, associated with underfloor heating. Over the years, BRE has investigated numerous cases where stone or ceramic tiles have been laid onto a screed only for cracks to appear in the tiles and along grouted joints within a few weeks of operation of the heating system. The tile cracks and open joints are almost always caused by movement of the screed at a pre-existing crack or, in some instances, a ‘day’ joint in the screed. This movement, although only a fraction of a millimetre, is sufficient to crack even thick granite slabs. The cracks in the screed are normally the result of a poorly designed floor screed (ie badly coordinated movement joints) or failure to properly commission the heating system before the tiles are laid. 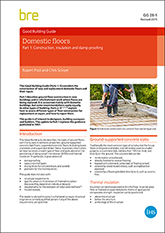 This Information Paper sets out BRE’s experience of screeds that contain warm-water underfloor heating systems and describes how the risk of cracking can be minimised and how repairs can be undertaken. 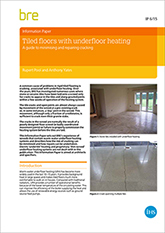 Electric ‘undertile’ heating and proprietary ‘thin-screed’ underfloor heating systems are not dealt with in this publication. This Information Paper is aimed at architects and specifiers.